In a large pot, add two spoonfuls of olive oil and when hot, brown the meat pieces in batches, thoroughly from all sides. Add the onion and garlic and continue frying for two more minutes. Add the grated tomato, the tomato paste, nutmeg, allspice, a little salt and enough water to cover the meat completely; allow to simmer for 60 minutes until tender. Meanwhile, add 4 tbsp olive oil in a sauce pan and fry the aubergines on medium heat for 4-5 minutes each side. Remove the aubergines from the pan and set them aside on kitchen paper towel to drain. 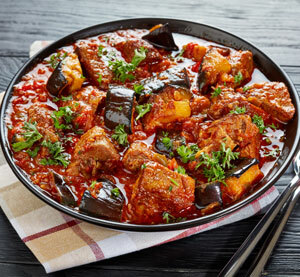 When the meat is almost done, add the aubergines and the mustard – as well as a little extra water if necessary – and cook for another 20-25 minutes until the sauce thickens. Season with salt and pepper and shake the food around in the pot so it does not stick to the bottom.